The night before after i got the confirmation from Val that i'm going for the run, i started searching videos of the previous run on youtube to "prep" myself and i realized it's gonna get really messy and dirty! I started thinking what to wear, what to pack, which bag to bring, which pair of shoes can afford to be stained etc. Before i head to Sentosa, i even head to Daiso to get zip lock bag to contain my iPhone so that i can bring it during the run to take pictures along the way. But don't say liao, in the end the zip lock bag got dirty and most the initial photos turned out blurred so i decided to risk my iPhone and took it out of the zip lock bag! 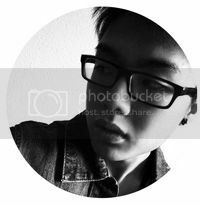 All photos in this post taken using my trustworthy iPhone! There were about 9000 runners that day (this is only for the 1st day!) and 15 mins before the flag off was the warm up session at the main stage by the fitness instructors. Everyone was super hyped for the run and there are those super enthusiastic ones who specially dress up for the run! There were people with colorful wigs, people wearing tutus (even guys!) and the one who caught my attention was this couple who wore a pair of matching unicorn costume! 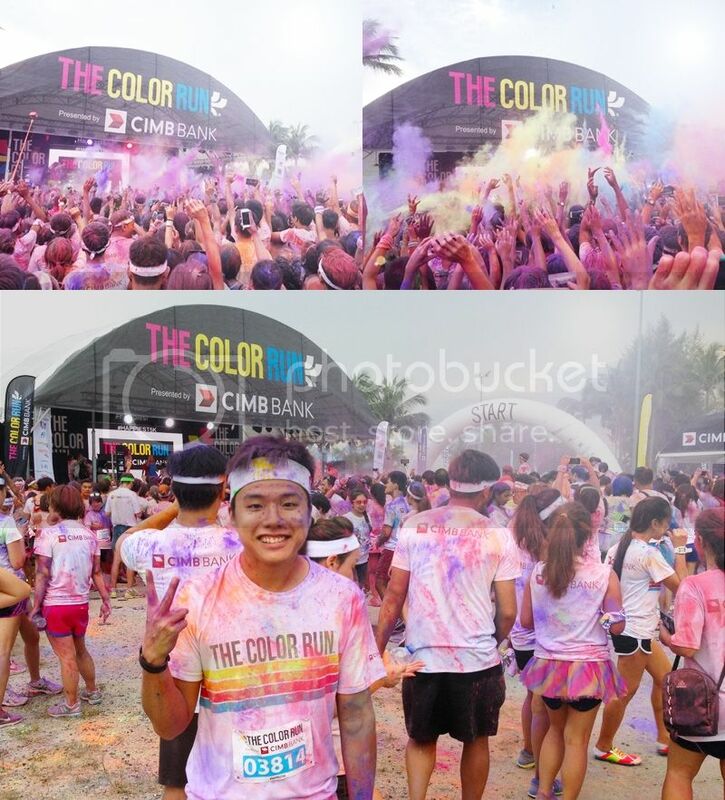 They started off white and clean but you can imagine how colorful they are when they reach the finishing line, literally rainbow unicorns! Because of the large amount of people, we were flagged off as different waves to cater spaces in between. At the end of every kilometer there will be a color zone where volunteers will be there to "attack" you, making sure you leave the zone with colors all over! The whole 5 km took us about 40 mins because people tend to have a lot of fun at each stop, taking group photos, scooping up the excessive powder on the ground or taking powder from the volunteers to throw at their friends or strangers. 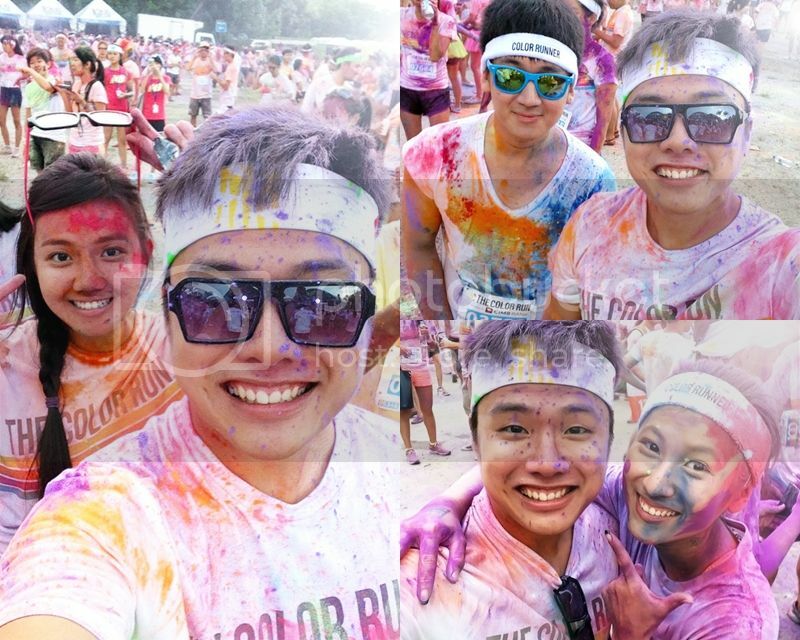 This is probably the only time you get to throw colored powder at someone's face without them feeling offended, LOL What i noticed is the genuine smile on everyone's face throughout the 5 km run. Strangers smiling at each other, high five-ing each other along the way. It really reflects the hashtag - Happiest5K. 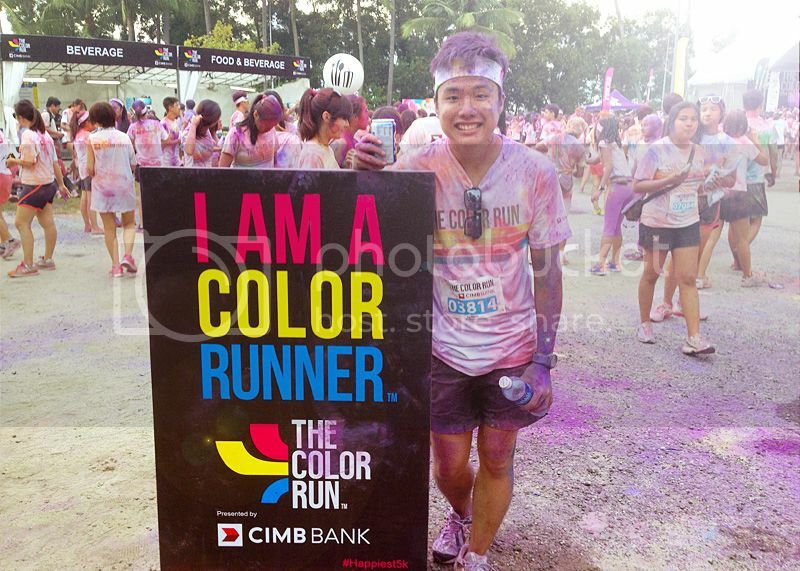 By the way I have no idea why my face and arm still look so clean in the above photo at the finishing line. It's not the end! ARE YOU READY FOR THE COLOR PARTAYYYYYY!